– In a smallish heavy frying pan, weigh 75g of golden caster sugar. – Over a medium heat, stir the sugar until it dissolves, then add a big pinch of salt, the butter and a splash of sherry vinegar, and keep stirring. It’ll go foamy, keep stirring on the heat until it has gone a mahogany brown. Take great care not to burn yourself, use oven gloves and don’t let the sugar burn. – Now add a table spoon of honey and the leaves of half a dozen sprigs of thyme, take off the heat and stir in. Place a long sprig of thyme on top of the caramel for decoration. 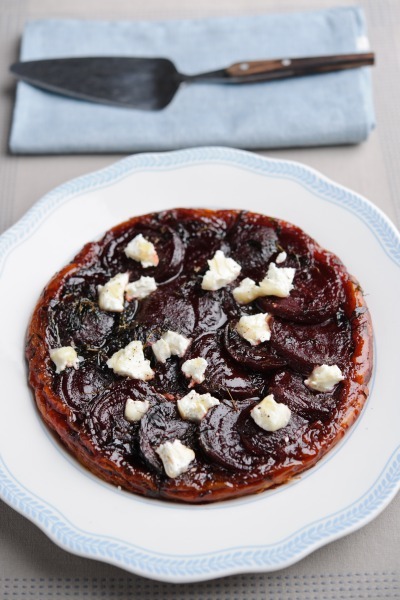 – Slice the cooked beetroot into nice fat slices and carefully (so you don’t burn your fingers) arrange the slices fanned out and working in a spiral into the centre. Use all the beetroot up, covering any thin-ish parts with beetroot bits. Season the lot with a pinch of salt and a twist of pepper. – On a lightly floured work surface, roll out about 250g of puff pastry, (shop bought is fine) and once it’s rolled out enough to cover the beetroot, place it on top, tucking the edges down into the pan. – Put the whole lot into a preheated oven at 180oC for about half an hour or until the pastry is golden. – Place an upturned plate over the frying pan (it should be bigger than the pan) and holding the two together, flip the lot over. Leave it 30 seconds for the caramel to mostly fall from the pan onto the plate then whip it off. 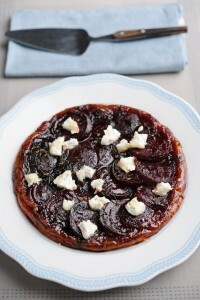 – Serve by the wedge whilst still warm with a disc of goats’ cheese on top, and, if you fancy, a drizzle of honey.